1. Mandi from Vintage Revivals painted over the art completely with a monochrome color and add some texture with glaze. 2. Painted typography is an easy modern update over a painting. 3. Micheal from inspired by charm turned a really blah thrift store painting to a work of art by adding dots of color. It looks like a Monet painting. Check out the before here. 4. Use stickers and and a paint brush to create a block of typography. 5. Use painters tape to add some graphic bold color to a landscape painting. 6. 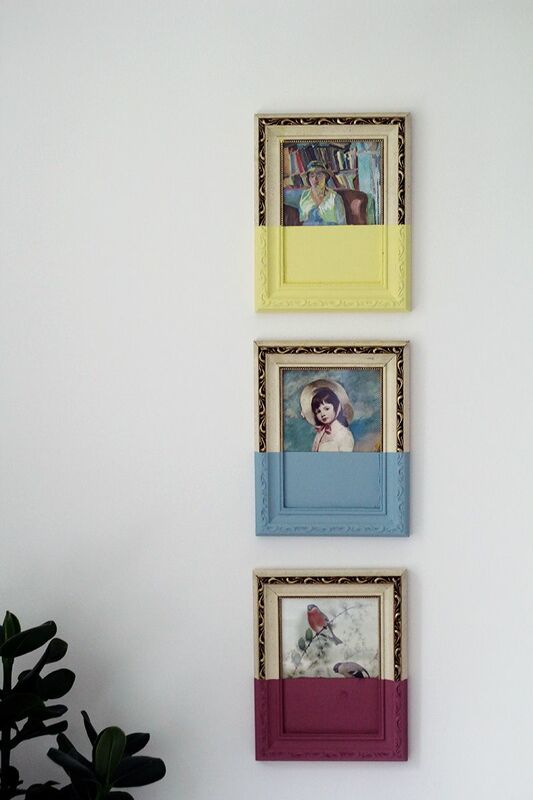 Don't change a thing and make a gallery wall out of thrift store finds. These pieces look updated by being styled to look like a collection. 7. I love how Amanda from the Red Jet freshly painted the frame and the paint overflows into the picture. 8. Ashley used a thrift store painting as a paint by number type of guide. It really looks like she freehanded it. 9. Changing the entire painting looks daunting to me but I love this version that updates only part of the painting with paint markers. See the before and after here. 10. The bold dipping of color gives such a modern twist to the dated art. Thrifting wins again! Want more upcycles from everyday objects? Check out this Cubly post here.